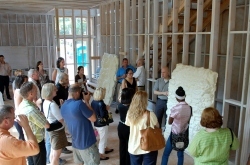 On Wednesday the Green Council of the Atlanta Board of Realtors put on a tour of the Midtown Green House. The Midtown Green House is a home being built in Midtown Atlanta by the Hoots Group and was designed by Joel Kelly Designs. The house is tracking all of the major green building certifications including LEED for Homes, ENERGY STAR, EarthCraft House and NAHB Green Building Standard. This was an opportunity for Realtors to see what a green home looks like before a lot of the elements are covered up with sheetrock. The house has a lot of great features including solar thermal (hot water), geothermal HVAC, Icynene spray foam insulation, Superior Walls, Marvin windows, and rain water collection with a 5,000 gallon cistern that will supply water for irrigation, the clothes washer & flushing toilets. We are planning to have a follow up event in the fall once the home is completed so everyone can see the finished product. Stay tuned for an announcement on that. Manufacturer’s representatives were on hand to talk about their products and explain how they work. The Icynene reps brought cut-outs of their foam insulation and one of them turned into a great photo opp. Check out the pictures below. Social networks are gaining in popularity every day for business and personal use. According to the 2009 member profile from the National Association of Realtors, 33% of REALTORS® use social networking sites. We took a poll regarding social media usage by our agents at Atlanta Fine Homes Sotheby’s International Realty. Of our 140 sales associates, 89% of our agents are using social networking sites. On a daily basis, an astounding 46% of the agents at our company use sites like Facebook, LinkedIn, and blogs and 80% use them once a week or more.